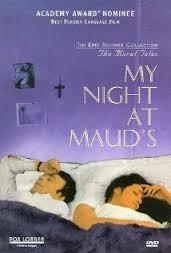 Hannagan Family: 1.12.69 - My Night at Maud's, and faith. I went to a film yesterday called both appropriately and inappropriately (because it gives rather the wrong impression ˗ people go expecting something quite different to what it is) My Night at Maud's. Basically it is a love story about (for once) an actual Catholic ˗ not one of your so-calleds, not a saint who despises all non-Cs, but a Catholic trying hard to live up to his faith in a very modernistic society. And though the majority of the audience found the Mass scenes funny (?? ), they were forced to appreciate this man as sincere in the story part of it. The funny (the really funny) thing is that it parallels recent events of my history ˗ not so much in story as in the fact that I’ve only found after the H business what this faith lark is all about. (Not all about it ˗ but I’m starting to get a glimmer of why it is valid, and why we’re not a pack of fools, we Catholics.) Did I tell you I bought another Michel Quoist book ˗ Marilyn gave me his first ˗ they’re on living in the modern world from a Catholic point of view ˗ but I didn’t even properly understand this book, until after the H bit had blown over. The man in the film said he only understood a more moral point of his faith after he’d known some woman well! I’m finding, too, how worth it is striving, and how possible. About music and me, I mean ˗ I feel now that it doesn’t matter if I spend a whole year just catching up ˗ I’ve reached a stage now of seeing the top of one hill, though I’m not yet there, and don’t see the point of merely going job-hunting in order just to be in the swim. P.S. One of the funniest things about the Compton Cinema is that frequently the customers come back wondering whether they’ve seen the film or not!